I’ve been doing a little digging. 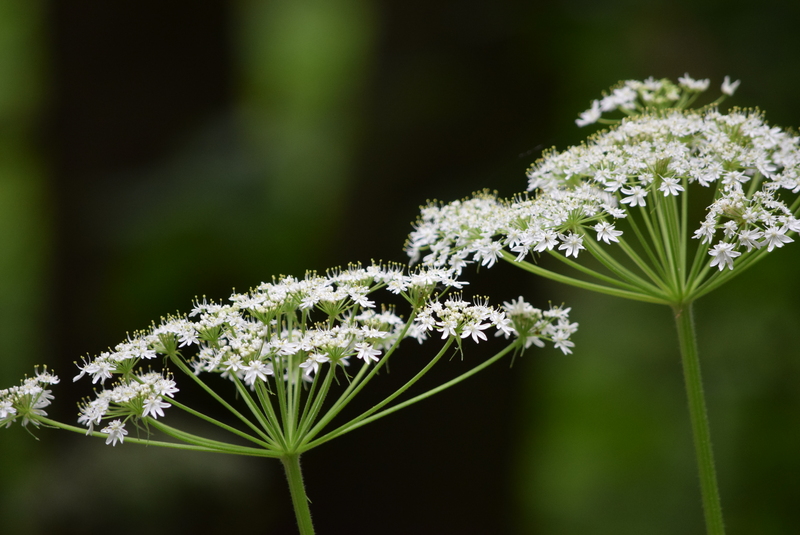 and poison hemlock (Conium maculatum). Quite literally, it’s the difference between life and death. 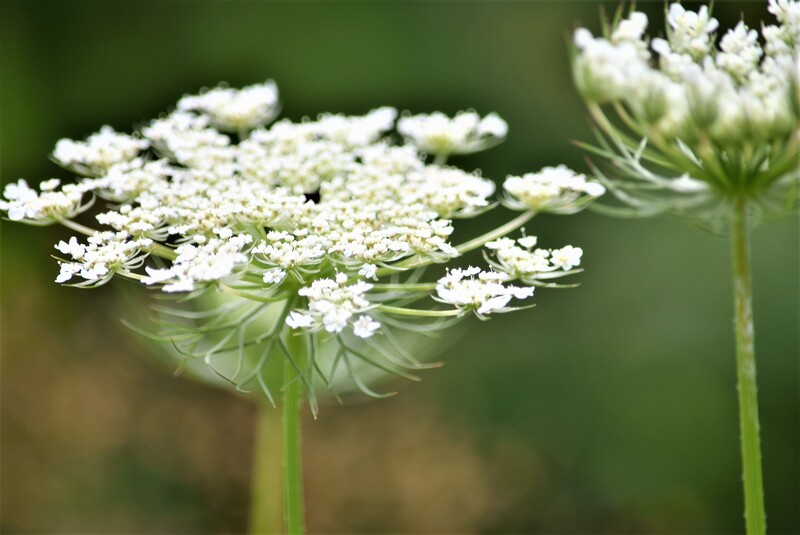 Unlike Queen Anne’s lace, parts of which are edible, poison hemlock is as its name indicates – a deadly plant and definitely NOT for eating. But easily confused, apparently, by me. 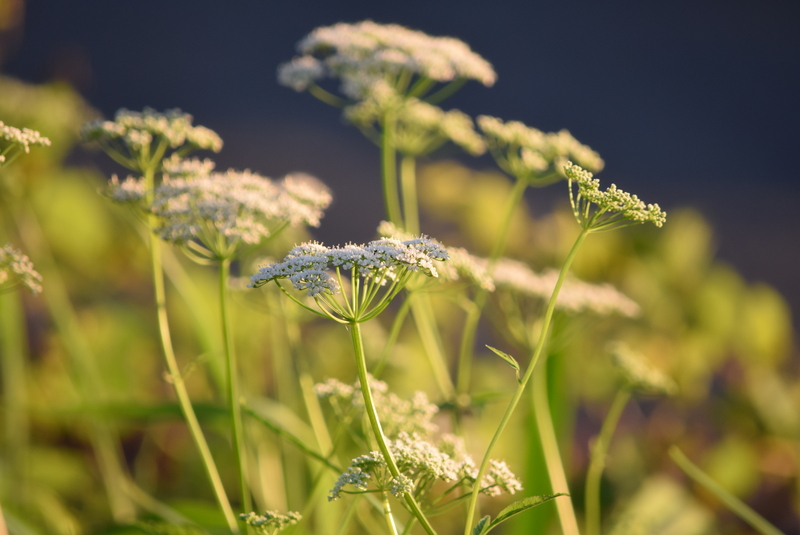 All this time, I thought I was taking photographs of a prolific and well-loved wildflower – or invasive weed – depending on your point of view. When in reality, I was also sometimes photographing a poisonous imposter. 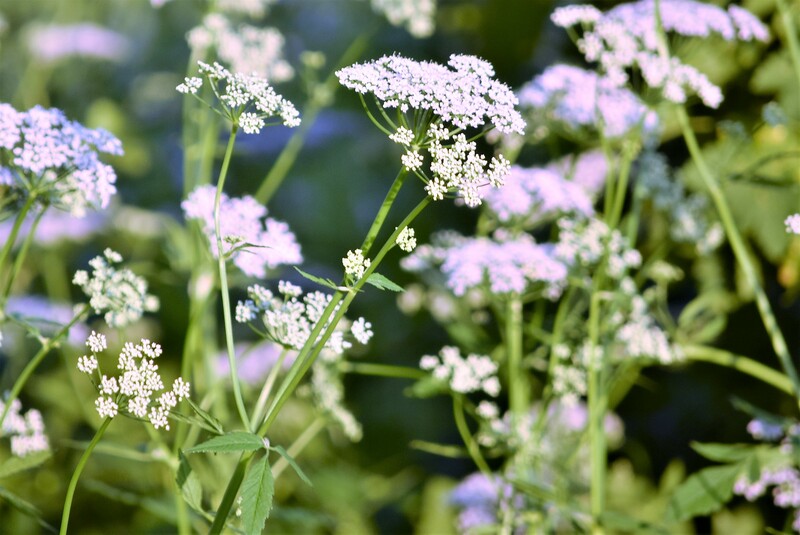 I even enlarged and framed one of my photographs for our guest room, believing all the while it was lovely Queen Anne’s lace which so nicely complimented the old quilt on the iron bed. Turns out … I was dead wrong. 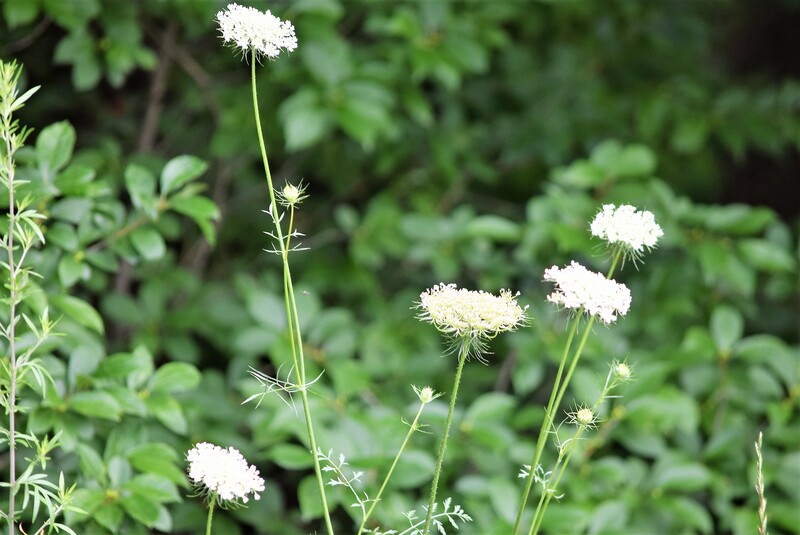 Named for Queen Anne of England (1665-1714) this lacey flower is frequently found roadside around my New England home. It’s a summer meadow filler too, dainty-looking, but a bit tough to pick. The flower begins and ends its life pulled in tight on itself in a delicate, little ball – blooming wide open only in the hope of pollination. Legend has it Queen Anne was quite a lace maker. Once upon a time, she pricked her finger and a single, tiny droplet of royal blood fell upon her lace work – just like the tiny, purple spot found within the central area of her namesake flower. I just love a story where someone else’s past shows up in my present. 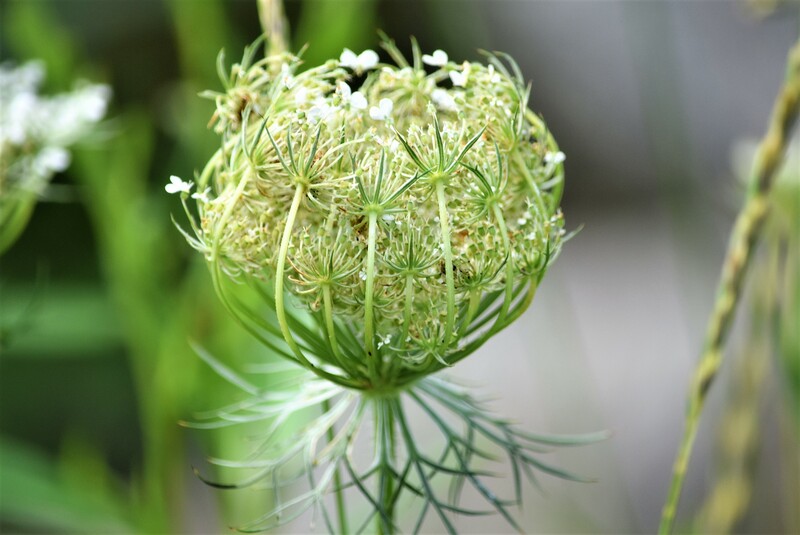 A biennial, Queen Anne’s lace is also known as wild carrot. It’s high in sugar and since Europeans cultivated it, American colonists came to use it as well, boiling the taproot – sometimes in wine. First year plants are best. Roots work well in soups, stews, and tea. Leaves work well in salad, as do the flowers. I, for one, plan to continue enjoying both of these flowers, which tend to like the same kinds of space, from behind my camera. It’s safer there, it doesn’t much matter which elegant flower is which, and my life doesn’t depend on telling them apart. I reckon my feet know where they want me to go … walkin’ on a country road. The smell of this Sunday’s stroll brought me back to childhood. I lived two weeks a summer visiting family in northern New Hampshire, skinning my knees, chasing after fireflies, and plucking wildflowers from fields filled with long grasses and a whole bunch of bees. I could smell all those memories yesterday afternoon walking on a country road. We kept company with goats and turkeys, and we’re newly nodding acquaintances with an old Mack truck backed up into the woods. Country roads are like that. You never know who or what you’ll meet along the way. Nothing fancy out there, probably, but the breathing’s easier and life feels just that much simpler. It’s like finding a little bit of freedom. Because when you’re walkin’ on a country road, the distance may be long – but the pace is slow. And the burdens don’t feel quite so heavy.